We invite country music's media partners to provide inquiry and insight into the industry's progress as they implement these changes. In our search for solutions for the many problems that have risen to our collective consciousness in the era of #MeToo and Time's Up, WOMAN looked throughout the industry to find existing codes of conduct. Our initial theory was that there must be an absence of any kind of universal standard for how country music's executives ensure protections and provisions for a safe and equitable workplace. What else could possibly explain how the industry has amassed so many publicized instances of a failed system? Many record labels, management companies, radio conglomerates, tour and event specialists, media partners, digital outlets, reporting systems, and others already have detailed codes of conduct. Entities throughout the entertainment landscape have made their codes available online which offers, whether intentionally or not, an open-source option for all those wrestling with the realities of our pervasive problems. In addition, we compared this list to the Billboard's 2018 Power 100 list. Interestingly, many of the companies represented on the Power 100 list are not referenced above. Several known industry leaders do not publicly provide internal governance documents but do display content regarding their external social impact. Furthermore, others proudly link to career opportunities within their company without offering a sample of what one might expect from the company's culture. The references above are by no means an exhaustive representation of the resources available. Their existence did change our area of concentration though. These codes should not be seen as optional or obsolete. Rather, they are an initial investment into the protection and productivity of a valued workforce. We are not without examples of considerate conduct. However, the country music community does lack consistency. A code of conduct merely provides the foundation from which to build a more considerate and conscious culture. Identifying standards for how people can and should expect to be treated within a company cannot be considered optional or obsolete. A code of conduct is simply a sturdy foundation from which a more vibrant and conscious culture can be built. The music business is dynamic and works in many non-traditional arenas. Codes of conduct help employees and leadership successfully navigate all areas of the work with certain assurances. Interestingly, of the companies that currently provide public access to their codes of conduct, many do so as part of the Investor Relations section of their website. WOMAN believes this is a strong indicator that a company lacks a conscious culture. First and foremost, codes of conduct contain promises and protections to those within a company's purview and employ. They are a continuing conversation among colleagues. To solely focus their value outward, as part of a company's attractiveness to investors, demonstrates a lack of understanding about a code of conduct's intrinsic value and internal necessity. A publicly available code of conduct shows an internal commitment from company leadership to truly value their employees and partners. It also serves as an external demonstration of how much the leadership of a company has invested in its own future success. As several codes of conduct are already circulating online among the biggest companies in the business, WOMAN was challenged to consider why there could still be such a struggle in implementation resulting in our very public parity problems. We believe one primary reason was that the words on the pages have not yet been elevated enough to become a tangible part of each company's culture. What is needed now are leaders who choose to embody the standards within their codes. Every company has a culture and it’s the leadership that helps set tone for whether that culture will be cautionary or conscious. In our pursuit to ensure the women of country music have MORE - marketshare, opportunities, resources, and equality, we have come to believe that the industry must first have MORE LEADERS. MORE LEADERS is not the end-all-be-all solution for country music's culture problem. 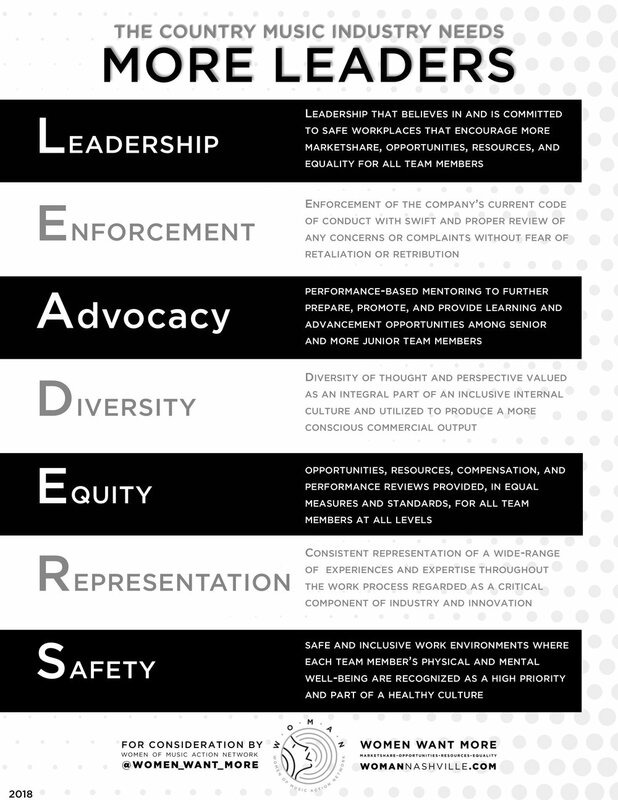 Our goal is to offer a suggested course of action that allows companies to take a more conscious approach to how they address concerns, cultivate talent, demonstrate exclusivity, encourage advocacy, and take meaningful actions to create a more safe and equitable workplace for all. To pledge support of a more conscious country music community, please send us an email. The quality of a culture is preserved by its commitment to consistently review and continually refine itself.